Take advantage of a commercial-quality draft beer tower made from stainless steel and offering two innovative Perlick faucets. For those who want to serve two high-quality draft brews in their home or commercial bar, this gorgeous dual-faucet draft beer tower checks all the right boxes. Both the body of the draft tower and lever of the faucet tap are made from 304 stainless-steel. The only liquid contact components that are not made of stainless-steel are the chrome-plated brass shank and tail piece. We also offer this draft beer tower with all the same components in 100% stainless-steel contact. You’ll also get two stainless steel Perlick Perl 630SS beer faucets. Featuring an innovative forward-seat design, this faucet model prevents the lever from sticking and is more sanitary than rear-seating designs. Perlick is a premium brand for beer faucets, so you know you’re getting an exceptionally designed, very durable product. The stainless steel beer tower will look amazing whether you mount it on your bar, counter top, or on the top of your kegerator. The column measures 3 inches in diameter, which is the standard size for suitable air flow to keep your beer cold. This convenient kit includes everything you need to install your new beer tower, including 4-ft. beer lines with fittings, two black faucet knobs, a mounting gasket, and mounting hardware. This was a replacement for a cheap single tap tower and a great improvement. It was an easy installation and a very solid dual tap tower. Installation instructions did not come with it. Simple enough to figure it out since I was replacing a single tap for this double tap. The holes on the new tower didn't match up with my kegerator. I was able to get two of the 4 holes lined up and secured. Still have to grind out the holes to get the other two matched. You would think these hole were standard on all kegs and towers. I had to replace the short hoses for longer hoses.Other than that, I was able to tap a keg before kick off. The tower is working great. It arrived without installation instructions but I was replacing an old one so putting it together and installing it was very easy. I got this tower because the last couple faucets I had got really sticky, to a point that I actually broke one from pulling to hard. I was surprised with how easy and smooth the action is every time. I had to take apart the faucet to figure out how to get the correct tightness for a smooth action, but after that it worked great. I received the draft tower last weekend, and did the install this week. The new double draft tower matched my kegerator so the install was very easy and quick. The new Perliick faucets are really awesome. Upgrading from a single tap tower to a dual and wanted some nice Perlick faucets. I wanted a high quality double faucet for my basement bar. the Perlick Faucets are awesome - much better than the one that came with my Danby fridge! Because of the Perlick Faucets and most of the reviews I have read are very good. I purchase a Perlick coupler recently and it works very well. Also my current tower is not locking the faucet in place so it's time to replace it. Perlicks are know for top quality so I choose this 2 faucet tower over the other options. I also read that KegWorks has good customer service; which is very important to me. Is there no collar to cover the screws at the base? There is no collar to cover up the screws. Mine didn’t come with screws so I just bought some nice finishing ones. Thanks Ken. I actually already purchased and was surprised there was no collar. Mine didn't come with screws or the rubber gasket like the pictures show either. Hi Ted, You definitely should have received the screws and mounting gasket with your tower. I will have a customer service representative arrange to have those missing pieces sent to you. If you need any additional help with your order, feel free to reach out to our customer care team directly at customercare@kegworks.com or call 877-636-3673. Cheers! The rubber ring is important. If they won’t send you one, you can seal it with some silicon. It helps keep the cold air in. Hello, there is no collar included. The screws are exposed. Doesn’t come with a collar. Is a mounting hole template or dimensions? Also what is the diameter of the bottom plate? BEST ANSWER: The diameter of the bottom plate is 4 1/2”. When you get the draft tower you can simply put it on a piece of paper and draw out a template for the three holes for the three mounting screws. This was a great up grade for my kegerator, they work great, are easy to clean, and looks awesome. The base flange is 4 1/2 inches in diameter. There are 4 equally spaced holes in the flange. I installed mine over a year ago and do not remember if there was a template included, but you could also use the included gasket as a template. Diameter of base plate is 4 1/2 inches, and there are four holes in a square pattern on the bottom of the plate with screws supplied. Can this be a replacement tower on an igloo kegerator? BEST ANSWER: Well technically speaking is not an exact match, I use the base of the Igloo and adapt with new holes and new screws to the new tower. I would think this could be used as a replacement for any kegerator that has a 3" or small hole cut for the lines and drilled holes that line up for the mounting screws. If the tower is screwed down, yes. But make sure the kegerator can actually fit two kegs before you get a two tap tower. With this tap can I hook up a Guinness and a Bass for Black and Tans? Sounds like a great set up! You can use this tower to start but you will need swap one of the included faucets for Nitro faucet in addition to having the proper coupler and beer gas to dispense Guinness. We sell a partial conversion kit that includes the faucet, coupler and an adapter so you can use a CO2 regulator on a nitrogen tank. You can have two beers flowing at once, yes, but must have the right CO2 setup. They also make special stout faucets that would be better for guiness, but not 100% necessary. Well for a proper Guinness pour you'd need a nitro system, so this might not be what you're looking for depending on how you like your Guinness. Should work just fine. Since this is just the tower and faucets, however you plumb your system underneath is up to you. How do I assemble 2 tapper system? 1. Assuming you have one CO2 tank, you'll need a gas line splitter or valve bar to run the gas into two keg couplers. A simple Y-splitter could work, but I used a valve bar to have maximum control (could turn the gas off on one empty keg but leave the other running). 2. From here, you need two of everything that a single system has...except the tower. Two CO2 lines, two keg couplers, two kegs, two beer lines and faucets (if your tower doesn't come with it). If you're familiar with your single tap system, this is the easier part. If you have two CO2 tanks - then you could run everything on its own system, sharing only the refrigerator and tower. I'm not sure what you mean? When I purchased mine it was completely assembled. 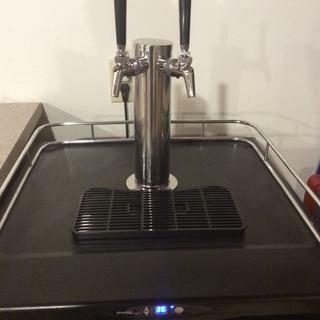 I just put in place of my old single tap on my bar counter, ran the lines into my keg cooler and hooked them to my low profile tappers. VOILÀ. Blue Moon and whatever else I decide to have on tap. YUM. Does the tower come with chrome or stainless steel shanks? BEST ANSWER: Hi Steve, the tower shank and tail piece included with this tower are chrome plated brass. Do you offer the 3 inch stainless steel tower with two perlick faucets and a stout faucet? Thank you for your question. We do not offer that tower set up as a kit. For that particular set up, you would need to order our 3 faucet 3" tower, perlick faucets and stout faucet separately. Can I get this with ball lock connectors for my homebrew kegs? BEST ANSWER: Hi Nathan! Thank you for your question. This item comes with a standard hex nut and tailpiece. You will have to order the ball lock connectors separately. Just snip the end of the lines and attach the ball lock connectors with screw clamps.